The first restaurant review on Veggie 101 had to be a good one...or in this case, a previously tried restaurant that was within 5 miles from my home since I didn't feel like driving after a long day at work. 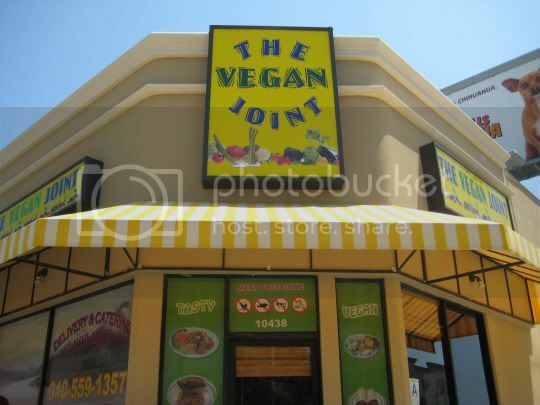 The Vegan Joint is only a couple years old, located in that underrated and unknown dining gem of an area in Palms (National and Motor). I'd eaten here once before when they first opened and had the soy fish sandwich, french fries, and vegan cheesecake (from an outside vendor). It was good enough that I remember always wanting to come back...but the lack of parking and somewhat inconvenient, high-traffic area kept me away, until now. The Vegan Joint is a small, family-owned (Asian) restaurant, with limited seating indoors (and out), but with a great neighborhood, low-key, cozy vibe. Prices are decent, and the portions usually can be finished in one sitting (no leftovers here). Beware credit card users, the minimum is $10. I was craving fake chicken drumsticks, which is what led my decision to come here in the first place. 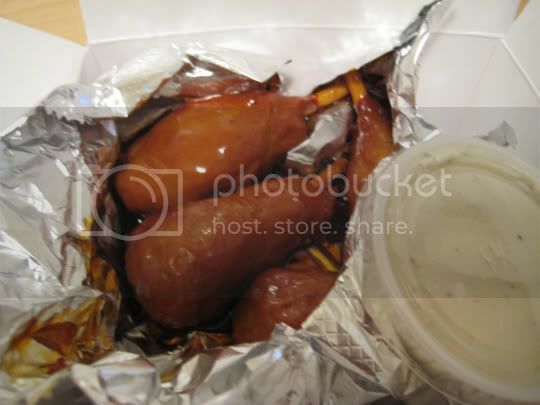 If anyone has ever had the fake chicken drumsticks that are served in those vegi-Chinese restaurants (usually from May Wah), then you understand my craving. Bathed in a super spicy, sticky, sweet chili sauce and served with a side of soy ranch dressing and celery sticks, these things are AMAZING. And it's not just the taste, which is better than any meat/chicken alternative that can be found in supermarkets...it's the TEXTURE. Juicy, chewy, tender...and it all can be bitten off of the "bone" (a piece of wood). My only gripe was how spicy the sauce was. My mouth was on fire well after I'd finished them. But would I have eaten 5 more? Hell yes. I'm not sure what kind of oil these fries are fried in, but I'm not crazy about it. It almost tastes as if it's been reused over and over again, with a sort of "stale" flavor. Maybe it's soybean oil? It definitely has a flavor to it, one that is not canola or peanut. Well, maybe it's peanut. Anyway, you get a pretty large portion of fries for the price...as well as a large portion of GREASE (evident in the pic). That bag was clearly (no pun intended) soaked through as soon as it was filled. A nice amount of Hunt's ketchup packets were included. I probably won't be ordering these again. This is probably what surprised me the most. 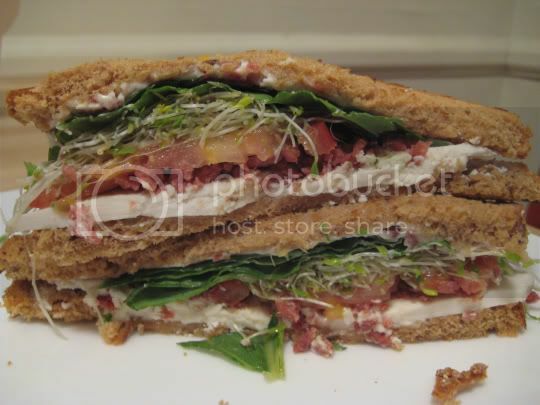 Lettuce, sprouts, tomato, Veganaise, and soy bacon bits...pretty normal, right? I could only eat one half of this (oh, I had to cut it myself) as I was so full from the drumsticks, but it was absolutely delicious. There was some kind of white soy cheese in the sandwich, and its saltiness and creaminess went so well with the smoky bacon bits. Most of the bacon bits fell out of the sandwich when I picked it up, but there was a substantial amount that I didn't really notice. Standard wheat bread was used, but I could taste that it had been lightly buttered and grilled. So delicious, I would definitely order it again, or even try to make it at home. Eat here again? Definitely, their list of yummy-sounding menu options is endless. 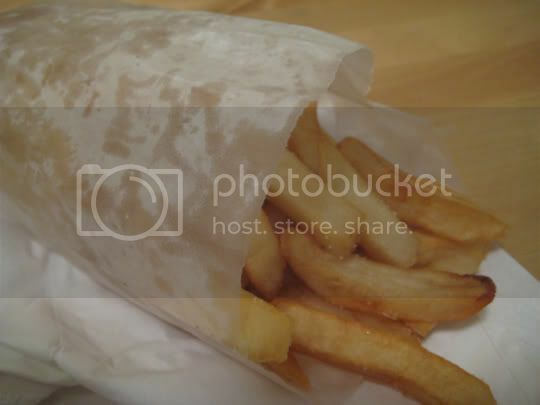 Dangggggggggg, looking at these pictures (aside from the fries) made me want to become a vegetarian. Lucky for me, as a meat eater, I can still enjoy the vegetarian life. Mmmmmm those drumsticks and sandwhich look sooooo delicious. Even when you mentioned soy fish sandwich I knew I must try. WOO HOO the resturant is right down the street. Thanks for the review.